Heard of the Night Wave? If you are having trouble falling asleep the NightWave Sleep Assistant can help. Anyone who has trouble sleeping should consider giving it a try, primarily because it is completely safe. Prescription and over-the-counter sleep aids might help you fall asleep, but as with all medications, there is the risk of side effects. In this case, the risks seem to outweigh the benefits. People have trouble sleeping at different times of the night. A person might have trouble falling asleep or staying asleep. While sleeping pills might help you fall asleep, they cannot be taken in the middle of the night. You would have difficulty waking up in the morning. You could have trouble driving or operating equipment. Morning drowsiness is a side effect associated with most sleeping pills, both prescription and over-the-counter. Some traffic accidents have been blamed on the side effect, even when they are taken 8 hours before a person needs to be up. Nightwave sleep assistant will not cause morning drowsiness. You will awake feeling refreshed. It will make it easier for you to fall asleep. If you have a tendency to wake up in the middle of the night, you can turn on the Night Wave to help you fall back asleep. Drugs are sedatives. They force your body into a sedated state, instead of allowing you to naturally reach that state on your own. Nightwave helps your body become relaxed naturally. It shines a pulsating light at your ceiling. Your job is to synchronize your breathing with the pulsations of the light. The pulsations gradually become slower and so does your breathing. Deep breathing exercises are commonly recommended for relaxation. Focusing on the breath is an important part of meditation. Yet it is difficult for people who are unfamiliar with breathing patterns to learn the technique. For many people, insomnia is caused in part by a busy mind. Being able to focus the mind on something outside of your body can help you stop thinking. This is another important part of meditation; to clear the mind. Clearing the mind is even more difficult than learning relaxed breathing. The light of the Nightwave sleep assistant gives you something to look at. As you focus on breathing along with the pulsations of the light, your mind starts to clear. Your muscles become relaxed as the tension slips out of your body. Night Wave basically covers all of the bases. There is truly nothing else like it on the market. Sound machines or white noise machines are sometimes used to block annoying sounds from the street or other irregular sounds that would stop you from sleeping. But sound machines may be annoying for your sleeping partner. The light of the Nightwave sleep assistant is not annoying. It is far less distracting than the irregular lights emitted by a television screen. So, you can use it to fall asleep and turn it back on in the middle of the night without disturbing anyone else in your home. To get the best results with Night Wave, you might also need to make some adjustments in your bedroom. Insomnia specialists refer to this as sleep hygiene. 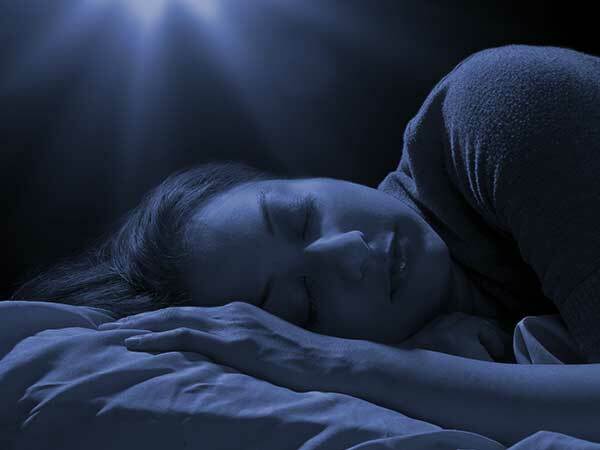 Noise, light and temperature can make it easier or harder for you to fall asleep and stay asleep. Noises should be reduced to a minimum. Lighting should be soft and muted. The temperature should be cooler than what you normally prefer during the day. By making those adjustments and using the Nightwave sleep assistant, you should notice a major improvement in the quality of your sleep, which affects the overall quality of your life. Considering that Night Wave could actually improve the overall quality of your life, it is definitely worth trying.